When submitting a paper to JFTA, It is the responsibility of the corresponding author to ensure that the work has not been previously published, is not under consideration for publication elsewhere and has been approved for submission by all its authors and the institution(s) in which the work was conducted. Papers submitted and accepted for publication have their copyright automatically transferred to the publishers. However, assignment of copyright is not required for authors who work for organisations which do not permit such assignment. The copyright covers the exclusive right to reproduce and distribute the article, including reprints or any other reproduction of whatever nature, and translations. No part of this publication may be reproduced, stored in a retrieval system or transmitted in any form or by any means, electronic, electrostatic, magnetic tape, mechanical photocopying, recording or otherwise, without permission in writing from the copyright holder. While the information in this journal is believed to be true and accurate at the date of its going to press, neither the authors, editors, nor the publishers can accept any legal responsibility for any errors or omissions that may occur. The publisher makes no warranty, expressed or implied, with respect to the material contained herein. 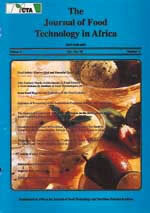 The Journal of Food Technology in Africa is published quarterly. It serves as a forum for original research findings on food science and technology with an expanded scope including food engineering, food management, food production and nutrition. It publishes high quality original research results on developments in food science and emerging technologies, covering subjects such as shelf-life and food safety, engineering scale-up, nutrition, economic and environmental aspects of food processing technologies. Food Science and Technology is viewed as an important instrument in tackling food security challenges. The major criteria for publication will be clarity, experimental soundness and advances in knowledge with special emphasis on concern and relevance to the food Industry in the African continent. Towards this end, papers discussing new methodology, experimental data or innovative ideas will be given priority due to their immediate importance. In addition to original research papers, the Journal also publishes, subject to consideration by the Editorial Board, invited Reviews and Editorials, Announcements and Reports of meetings. All papers are reviewed by international authorities prior to publication; however, the Editor-in-Chief reserves the right of final decision. Full-length papers should normally have a maximum of 12 printed pages, including references, tables and figure legends. Manuscripts should be prepared in standard grammatical English, using British spelling throughout; this is the responsibility of the author. Papers must be typed in double-line spacing (1 cm between lines), including references, tables etc., on one side of the paper only and with 3 cm margins on both sides of the page. Pages must be numbered while tables and figures should come on separate sheets of paper after the references, and not interspersed within the text. Manuscripts should be prepared on a computer wherever possible. Authors are requested to maintain a back-up copy in case revision is necessary. Title page: This is the first page and, as such should include the title of the paper (with no abbreviations); a running title of a maximum of 70 characters should be indicated; the full names of the author(s) and their postal address(es), clearly indicating the corresponding author. E-mail contact of the corresponding author is now a mandatory requirement to speed up communication. Abstract: Should be done on a separate page giving summary of not more than 250 words, describing the objective of the study, the methods used and results and the conclusion reached. It must be self-explanatory and intelligible without reference to the text and should contain no abbreviations. Up to seven Key Words suitable for listing should be provided at the end of the abstract. Main text: Should be divided into an introduction, Materials and Methods, Results, Discussion, Acknowledgements and References. Introduction: The introduction should contain a clear description of problem under investigation and of the aims of the study and the results, along with a brief survey of the existing literature. Materials and Methods: Sufficient information should be provided to permit duplication of the research work. Abbreviations should be avoided as far as possible; if necessary, they must be defined at first mention. No abbreviations should appear in the title, running title or abstract. The statistical methods used must be identified. When variability is expressed in terms of the Standard Error of the Mean (SEM) or Standard Deviation (SD), the numbers of observation (n) must also be expressed as more or less than or equal to a given probability (e.g. P< 0.01). The terms ìsignificantî and ìnot significantî must not be used in a statistical sense without providing the level of significance in terms of P.
Results: The results should be stated concisely without comment. The same data should not be presented in both figures and tables. If there is a desired position for figures and tables, it should be indicated in the margins of the manuscript. Discussion: The Discussion should add to the information being given without repeating what is presented in the introduction or results. It should deal with the relationship of the new findings given in the Results to the corpus of knowledge from existing literature and should be pertinent to the data presented. Acknowledgements: These should be as brief as possible. Any assistance that requires acknowledgement should be mentioned. The names of funding organisations should be given in full. References: References, typed in double-line spacing must be limited to publication cited in the text and in the tables and figure legends. The list should be alphabetical and not necessarily in order of first appearance in the text. Responsibility for the accuracy of the reference list lies entirely with the author(s). Tables and figures: Tables should be typed on separate sheets and in double-spacing with a number and title. Table titles should be self-explanatory without reference to the text. Non-standard units of measurement should be defined in the footnote to the tables and at first mention in the text. Figures will be printed directly from the originals sent by authors and should therefore be of high quality. Computer-drawn figures printed on a laser (not a dot matrix) printer are preferable. Figures may be professionally drawn on white board or tracing paper. Illustrations should not be larger than 15 x 24 cm and the point size of the labels and legends should not be smaller than 10-point font size. The photographs should not be mounted and the names of the authors and figure number should be written in pencil on the back with an arrow to indicate top of the figure. The photographs must be technically perfect and necessary for understanding the text. Proofs: The page proofs and original edited manuscript will be sent to the corresponding author, as electronic portable document (PDF) attachments, for approval and minor correction when necessary. Only typographical errors should be corrected. We expect a speedy response from the authors translating into only a few days. Offprint: The corresponding author will receive offprint as soon as they are ready, as a PDF attachment, without waiting for their printing, packaging and mailing. Complimentary copies to each and every author will be dispatched to the corresponding author when they are ready. Three (3) hardcopies of the Manuscript and computer diskette (3.5 inches), preferably in MS Word or Word Perfect. Figures (3 copies), labelled abbreviations for figures fully listed and explained. Acknowledgement of receipt of papers: This will be done by way of e-mail to the corresponding author.